Contrary to what the name might suggest, AudioEase's Cabinet is not a fancy piece of furniture in which to store your other AudioEase software, but rather a 'lite' version of their far more comprehensive Speakerphone (reviewed in SOS April 08), which, like their Altiverb reverb plug‑in, uses convolution in conjunction with impulse responses taken from real spaces or audio components. 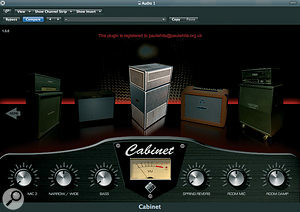 Cabinet, which runs on both Mac and PC platforms, is based on the impulse responses taken from five well‑known speakers, four of which are conventional guitar amps and one of which is a Leslie‑style rotary (but not rotating) speaker. Each speaker was recorded with two close mics, and you get a balance control to adjust their contribution, as well as a stereo width control to allow them to be panned to separate sides. There's also a distant room mic, the controls of which allow you to adjust the liveness of the room and the level of the room mic. If you need more ambience, you can also dial in some suitably vintage spring reverb, again courtesy of convolution. A Bass control brings up the low end of the familiar cabinet thump and there's a VU meter in the centre of the panel to help you keep an eye on levels. 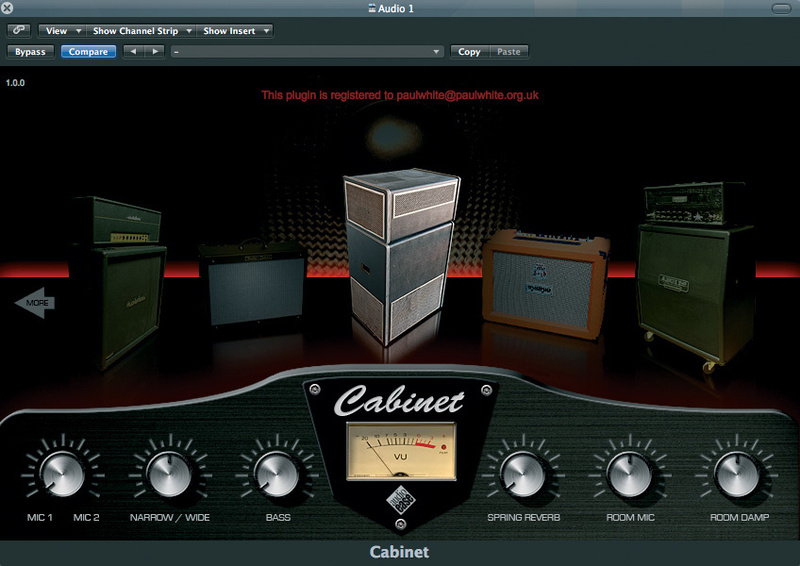 Cabinet isn't a one‑stop guitar‑sound package: it's designed to be used after a guitar preamp or software modelling preamp plug‑in (with any speaker emulation bypassed). However, it could be used alone for treating keyboards or for adding character to a clean DI guitar sound. The graphical interface shows pictures of five cabinets, clearly based on the brands used to record the impulse responses, and the control strip at the bottom of the window stays the same in all cases. Clicking on a cabinet selects it and accents it with a spotlight. To the left is what looks suspiciously like a Marshall rig based on a 4x12 cabinet, and next in line we have a 2x12 combo that appears to be a Fender. The rotary speaker sits in the centre, with an orange-coloured combo to its rig, sitting on its own 4x12 cabinet, to the extreme right. The 'I‑can't‑believe‑it's‑not‑a‑Marshall' speaker certainly has the throaty, raw and gritty edge associated with the real thing, while the smaller 2x12 combo has a brighter and more focused sound with less deep bass. By contrast, the rotary speaker sounds quite dull and boxy, but stick a mod effect in front of it, such as a fast, shallow flange or chorus, and the whole Leslie effect comes alive. Moving over to the orange combo gives a slightly thicker 2x12 sound than the other combo, while the rightmost 4x12 has a very aggressive edge and delivers a noticeably US rock sound. There's no specific detail on where mics one and two are placed, but the tonal characters are distinctly different, and balancing them provides a good tonal range that's further enhanced by bringing up the contribution of the room mic. AudioEase have always been at the cutting edge of convolution technology, with excellent high-end software like Altiverb. Cabinet brings that expertise to bear on the guitar speaker, and is much less expensive so, unless you always mic your guitar amps, it's well worth the small investment. AudioEase +31 30 24 33 606.